A rainbow has many colours. How can I remember the order of the colours of the rainbow? 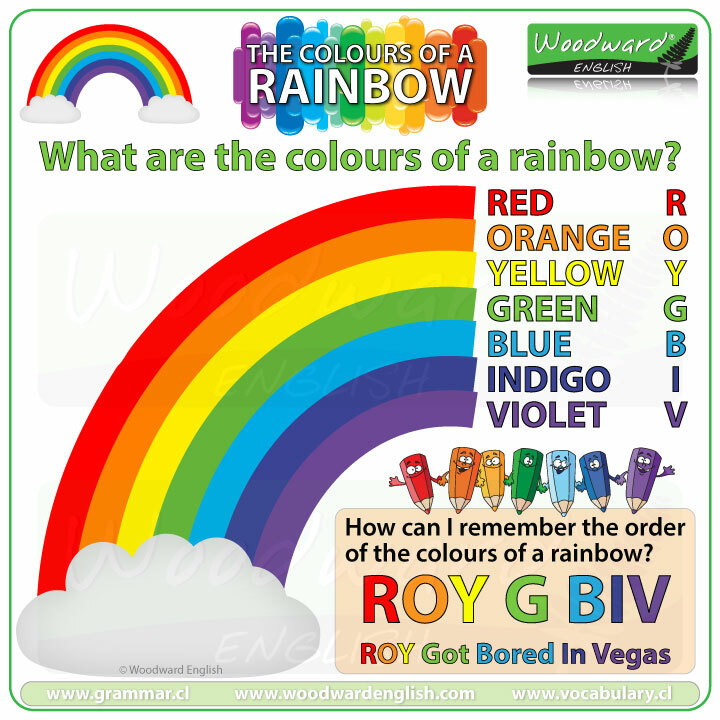 When I was at school here in New Zealand, we were taught an acronym to help us remember the order of the colours of a rainbow. An acronym is an abbreviation formed from the initial letters of a group of words and pronounced as one word. For example: UFO is an acronym. It is a short way of saying Unidentified Flying Object. To remember the order of the colours of a rainbow we use the acronym ROY G BIV. How can I remember the acronym ROY G BIV? You think of: ROY Got Bored In Vegas. Or some teachers use: Richard Of York Gave Battle In Vain. So, what are the colours of a rainbow?